Potential access problem on the approach from Baile Dubh/Ballyduff graveyard near Cloghane. 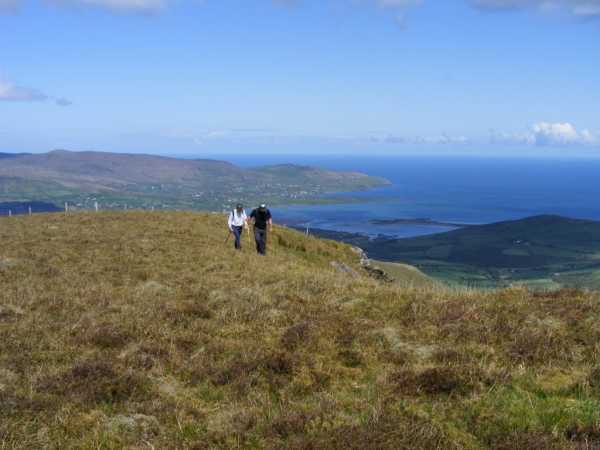 On 12 May 2012, followed Adrian Hendroff's route as per his excellent 'The Dingle, Iveragh & Beara Peninsulas'. This would appear to be the same access route as outlined in the Short Summary created by jackill above. Anyway, after following the road uphill from the graveyard, taking the right fork, and going through the rusty gate per instructions, we came across the following sign on the second gate further in, saying 'Private Property - No Walkers'. It was a temporary affair, just a printed A4 sheet in a plastic pocket. Being reluctant to turn back at this stage, we scaled a fence into the adjoining field and continued from there. For all we knew, this could also have been owned by the individual who put up the sign. Further up the mountain, we met a sheep farmer who was quite friendly, but neither we nor he mentioned the sign.